It is said that some writers prefer having written over the act of writing itself. Similarly, there are some books which I prefer having read over the act of actually reading them. Such books add to one’s knowledge base and help assimilate diverse threads of thought, but to get through them takes work. This was my take on Tatu Vanhanen’s indispensible study, The Limits of Democratization. It’s not that the volume is abstruse, meandering, or difficult to comprehend. Indeed, it is a solid work of political science which takes a highly focused, no-stones-unturned approach to reaching its conclusions. As rewarding as it is, however, it can at times be a difficult read for those not versed in statistics and the social sciences. Still, for any serious member of the dissident Right who wishes to spread the word beyond the choir, it is well worth reading. Vanhanen attempts to draw a causal line between national IQ scores and climate, on the one hand, and the extent to which any particular nation is democratic on the other. To do this, he explores the empirical data; creates operational substitutes for complex, hypothetical concepts; develops thirteen different variables which measure the quality of democracy; and performs regression analyses to test his hypotheses. He then classifies one hundred seventy-two nations into seven IQ categories and goes through them one by one. For one steeped in political science, The Limits of Democratization is a tour de force, a watertight argument for the reality of IQ and racial differences and proof of the unreality surrounding the popular, egalitarian perspective which strives to deny both of these. Throughout The Limits of Democratization, Vanhanen employs many graphs and tables, which help clarify things and serve as excellent points of reference as well. There are over twenty-five pages of tables in the book; sixty-two if you include the appendices. He also invents a useful shorthand for many of his concepts. For example, Index of Democratization becomes “ID” and refers to the variable he uses to determine how democratic a nation is. Beneath this neat moniker, however, is a formidable edifice of thought. Vanhanen decided that deriving ID requires two equally important values: competition and participation. He measures competition by subtracting from one hundred the percentage of votes the winner of an election received. Participation is simply the percentage of the population which voted in an election. These figures are then modified by election type, national power structure (e.g., parliamentary vs. executive), and by the occurrence of referendums in a given year. Vanhanen multiplies the two resulting figures and divides by one hundred for his Democracy index value. This, of course, is Political Science 101. Vanhanen explains why other scholars past and present have derived similar variables in different ways, and defends his method as useful and appropriate. He also uses similar techniques to derive variables for Mean Temperature (MT), Index of Power Resources (IPR), and national IQ. For IQ, he relies much on work done previously by himself, Richard Lynn, Arthur Jensen, and Helmuth Nyborg (who was a speaker at the recent 2017 American Renaissance conference). IPR, on the other hand, is a very important concept which is unique to these kinds of studies. It measures the “overall degree of inequality in resource distribution” within a country. Vanhanen identifies five indicators for this: student population, literacy, family farms, the degree of decentralization of non-agricultural economic power resources, and real GDP per capita. After defining and justifying each of these variables, he then coalesces them mathematically into IPR. 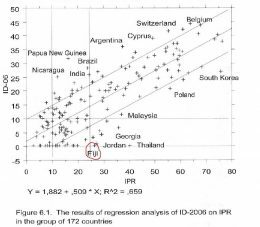 The higher the annual mean temperature (MT) of a country, the lower the values of national IQ, the Index of Power Resources (IPR), and the Index of Democratization (ID). 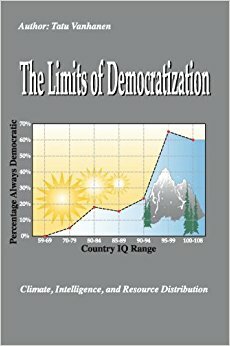 The higher the average intelligence of a nation (national IQ), the more widely power resources (IPR) are distributed and the higher the level of democratization (ID) in a country. The higher the degree of resource distribution (IPR), the higher the level of democratization in a country. I’m sure we can see the usefulness of such research for those of us on the dissident Right. Yes, IQ isn’t everything . But it is real . And if we can show this, then we can show that racial differences are just as real. And from there, it is an easy leap of logic to start arguing against multi-racial societies and in favor of ethnonationalist ones, White Nationalist ones in particular. And what better way to demonstrate the validity of IQ than to prove its positive correlation with the various levels of democracy across the world? What follows is a thorough and meticulous investigation; no stone unturned, indeed. 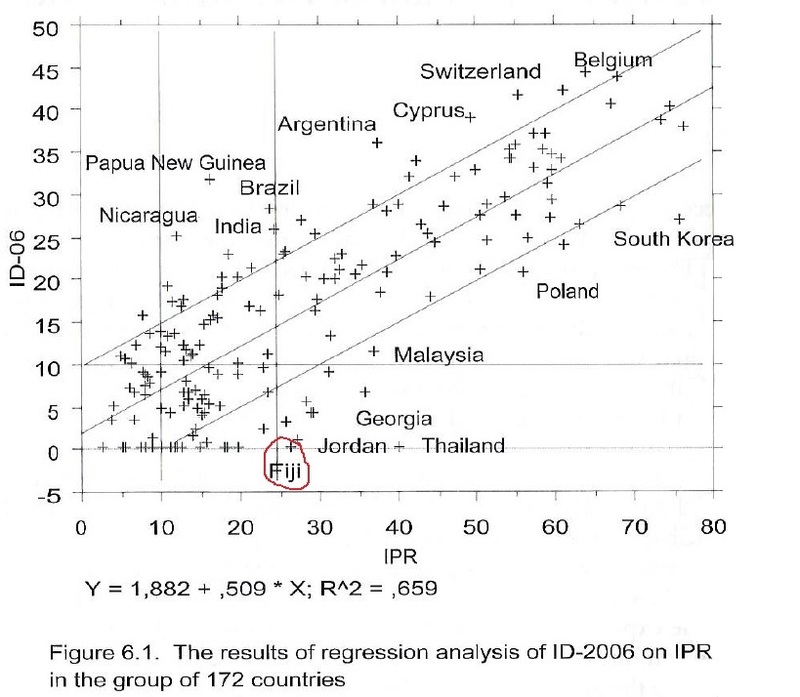 Vanhanen’s regression analyses demonstrate that “the hypothesized causal link between MT and ID is mediated by national IQ and the IPR, and that the causal link between national IQ and ID is mediated by the IPR.” He then reasons that “[b]ecause IPR is relatively strongly related to national IQ and MT, I think that it is justified to trace the causal roots of ID to national IQ and MT via the IPR.” He justifies this with an additional regression analysis which shows how MT and national IQ each have statistically significant correlations with IPR that are independent of each other. Further, when used together, they provide a stronger correlation to IPR than if viewed separately. Thus, MT and national IQ inform IPR, which, in turn, informs a nation’s democracy index. Vanhanen proceeds methodically from here, analyzing data on a minute scale, country by country, to link MT to IQ, then MT and IQ to IPR, and then IPR to ID. Of course, he discusses outliers, such as North Korea (high IQ, low IPR) and Lithuania (low IQ, high IPR) and includes their recent history, political structures, geopolitical region, and other specifics in his analysis. He concludes that MT and IQ account for sixty-four percent of the variation in IPR across the globe, and that IPR accounts for sixty-six percent of the worldwide variation in democracy. Fiji turned from a large positive outlier into a large negative outlier in December 2006 when the military usurped power and displaced democratic institutions. Politics in Fiji has been highly polarized because of the ethnic tension between indigenous Fijians and Indian migrants, but they were able to maintain democratic institutions with some interruptions. Because of the ethnic cleavage, important power resources may be more widely distributed than IPR indicates, but, on the other hand, the unsolved ethnic conflict endangered the survival of democratic institutions. The military usurped power in 2006, but probably only temporarily. Fiji’s high IPR value predicts a return to democracy. After years of delays, a democratic election was held on 17 September 2014. Bainimarama’s FijiFirst party won with 59.2% of the vote, and the election was deemed credible  by international observers. This is frankly astonishing, and if they don’t call this sort of thing a home run in political science, they really should. The predictive power of statistics is always a delight to behold. The Limits of Democratization is a highly useful work for three main reasons. For one, it gives the Pat Buchanans and Peter Brimelows of the world something to crow about (which is a beautiful thing, no doubt). This is the purpose of political science: using scientific investigations to help shape public policy. Any news media personality on the Right who still has a smidgeon of influence should be able to use this work to help dissuade Congress or individual Congressmen from spending millions to help ease some poor, Third World country’s transition to democracy. After all, a lost cause is a lost cause. Another benefit of Vanhanen’s labor is that it will show the Left that the Right has its number. If enough people were to internalize the hypotheses and conclusions of this book, even in digest form as I am providing now, then Rightist positions, especially the more radical ones, will be that much harder to dismiss. To the extent that the Right is still on speaking terms with the Left, pulling out Tatu Vanhanen in a discussion on IQ or racial differences is tantamount to throwing a muscle-bound, semi-pro ringer onto the field during an office softball game. People on the Left will not have heard of Vanhanen, for one. And secondly, they will have no intelligible response to his conclusion that national IQ is a major factor in determining any nation’s level of democracy. (I’m speaking from experience here since I have done it twice and scored points each time in discussions with Leftists.) Finally, if Leftists decide to challenge Vanhanen, let them. Chances are they will not even understand his findings, let alone have the wherewithal to dispute them. A final benefit of a book like The Limits of Democratiztion is that it will (or should) inspire people on the Right to learn about statistics and become more conversant in political science, if we haven’t already. Political science is no longer boring once you feel its power, especially its predictive power. And, if anything, Tatu Vanhanen demonstrates this power quite cleanly. If we are pushing to change the world either through activism or metapolitics, then sooner or later the question will arise: “How do you know your way is right and the current way wrong?” Tatu Vanhanen is one of the ways by which we know. And the better we understand him, the more convincing we will be. And if you can be convincing when it matters most, you will have forgotten all the hard work you put into reading The Limits of Democratization, and instead will be extremely grateful for having read it.